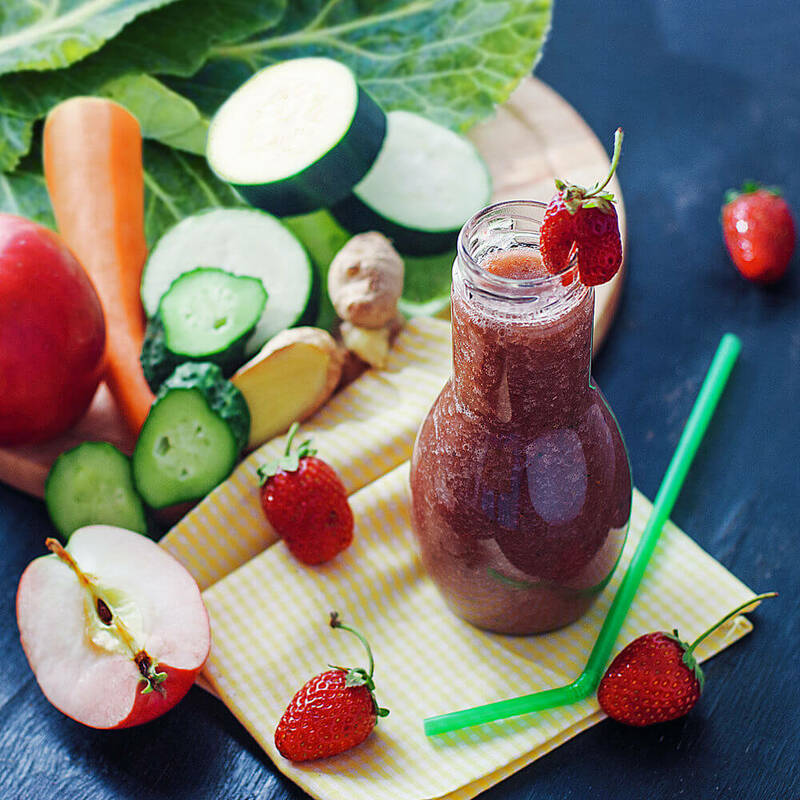 This delicious, naturally sweet and juicy tasting smoothie is sure to be refreshing thanks to the carrots, cucumber, strawberries and ginger it contains. It also has a very good amount of vitamins A, C and K which are important for maintaining healthy bones, eyes and skin. The humble looking apple is incredibly beneficial to our health, more so than we give it credit for. As well as having a positive effect on cardiovascular disease and helping to prevent cancer, apples are popular with scientists because they have an amazing effect on improving neurodegenerative conditions like Alzheimer’s. It is thought that apples can have such an effect on neurodegenerative diseases because they contain an antioxidant called quercetin that has been shown to reduce the rate of cellular death in neurons in the brain. Carrots are extremely versatile and provide a naturally sweet flavour to recipes. By including a carrot in this smoothie you can also hope to benefit from the antioxidants and vitamins that it contains. Carrots help maintain eye health, improve skin health and detoxify the body, thanks to the high levels of vitamin A they contain – a single cup of chopped carrots contains more than four times the daily requirement! Vitamin A is essential for helping to maintain eye health, as well as helping skin membranes to repel attack from bacteria. Collard greens contain a lot of vitamin K, which is essential for helping to maintain healthy bones and allowing your blood to clot properly. It is also an abundant source of vitamins A and C. Collard greens belong to a group of vegetables known as cruciferous vegetables which contain glucosinolates that have been shown to impede cancer growth. Being 96% water, cucumbers help to keep you hydrated which has a positive impact on overall health, as well as helping the digestive system and brain to work properly. Cucumber also helps to repair the skin and keeps it healthy because it contains magnesium, potassium and silicon. It can also provide relief from bad breath by soothing and refreshing diseased gums. Ginger is well known in traditional herbal medicine for being an anti-inflammatory and, therefore, can help to ease stomach cramps and post-exercise muscle pain. This spicy root has also been scientifically proven to be successful at relieving symptoms of nausea and, in particular, is able to reduce instances and severity of morning sickness. Ginger is an excellent source of manganese, which plays an important role in ensuring that the metabolic system works properly and healthy bones are built. By adding strawberries to your smoothie you will be significantly increasing the level of vitamin C in your body, with one cup containing as much as 149% of the daily allowance, as well as good amounts of nearly every other vitamin and mineral your body needs. Strawberries are also an excellent source of disease fighting antioxidants that help to protect the eyes and brain from damage caused by free radicals. These same antioxidants also have a significant impact on preventing the symptoms of arthritis. Also known as courgette, zucchini is a low calorie, yet filling food that will help you to lose or maintain a healthy weight, whilst giving you a good dose of B vitamins and vitamin C, as well as nearly all of the trace minerals. The peel should be included in your smoothie because it is the main source of dietary fibre in the zucchini, which is important for keeping your digestive system healthy.